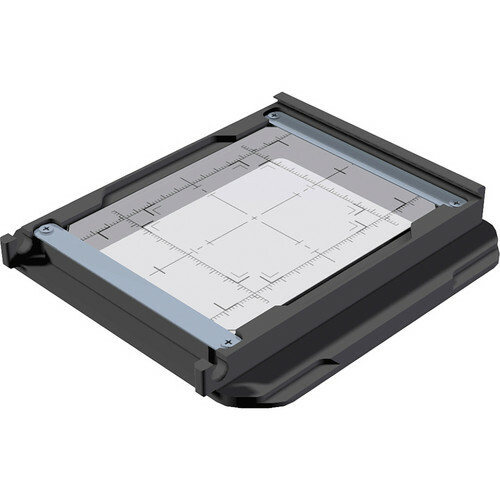 The Universal Ground Glass Frame for SLW-Mount by Cambo is designed to be used in the SLW adapter interface of Cambo Wide RS, Wide DS and Ultima 23 cameras and sliding-back systems. It offers measuring marks that correspond to six current CCD sensor sizes as well as markings for the Phase One 65+ and Mamiya Leaf Aptus II 10 and 12 digital backs. The frame can be mounted in either the landscape or portrait position and contains a fresnel lens for better focusing. Universal ground glass frame installs in place of SLW mount on Cambo large format cameras. Measurement marks on glass correspond with the Phase One 65+ digital back and the Mamiya Leaf Aptus II 10 and 12 digital backs. Measurement marks on glass match current CCD sensor sizes for more accurate framing and focusing. Measurements are 33x44mm, 36x36mm, 36x48mm, 36x56mm, 37x49mm and 41x55mm. Box Dimensions (LxWxH) 5.9 x 4.5 x 0.9"